Last week, we drove over the border into Cambodia. Within a few days, my face and hands sprouted a rash. My eyes turned red and itchy. I’ve also been struggling with dressing modestly. The heat index is approaching 40C. The last thing I want to do is put on pants and a shirt with sleeves. I am finding it hard to take deep breaths. These dusty, hot conditions have produced a body I do not recognize. I am wearing glasses. My hair is pulled up in a bun. I’m wearing sweaty hiking clothes. I am trying to keep my heart open. There is so much to take in. 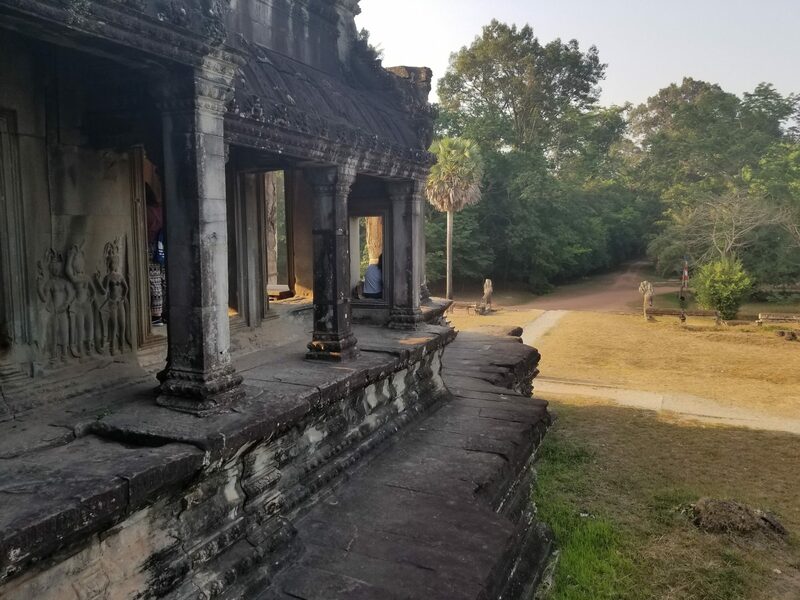 We watched the sun rise over Angkor Wat. We cycled through the countryside. We were generously welcomed into peoples homes. We were taught how to dance to popular Cambodian music during New Years celebrations. We also learned about some of the history of Cambodia. We visited the Killing Fields and the Tuol Sleng Genocide Museum. It’s one thing to know millions of people were murdered by their own government. It’s quite another to stand on the land where this violence happened. To see the stains on the floor of a prison cell. To see the excavated mass graves. To hear the stories of how this impacted people. And has continued to shape the country. Content Warning: Violence. . . . . . Today we had a very emotional tour of the Killing Fields where the where the Khmer Rouge executed over one million people between 1975 and 1979. This is a photo of some oragami peace cranes I saw inside the Buddhist stupa built to honor the victims. Inside the monument, there were 10 stories of skulls from nearby mass graves. If you swipe through these photos you'll see you'll see some of the art, signs and memorials we saw today. There is no way I would have learned as much as I have without going on a tour led by someone from Cambodia. Sovann is incredibly knowledgeable, open and funny. Over our 10 days together, he has been very willing to share both Cambodian history and his own stories. It’s a been such privilege to learn and experience all these things.